Right after the Spring 2011 International Quilt Market, I took my Every Which Way quilt down from my booth walls and it went right into the arms of the ladies of a local quilt store! It's been on display there ever since and I haven't been able to feature it here on my blog yet. I'll be getting it back next week, but I couldn't wait to share with you another version of it. My friend Aniva, made this version for her son. She added a stop border and an outer border to make it double the size of the original pattern. Aniva used Riley Blake's Alphabet Soup Boy (main) as her inspiration fabric. It's perfect because it has little arrows on it! 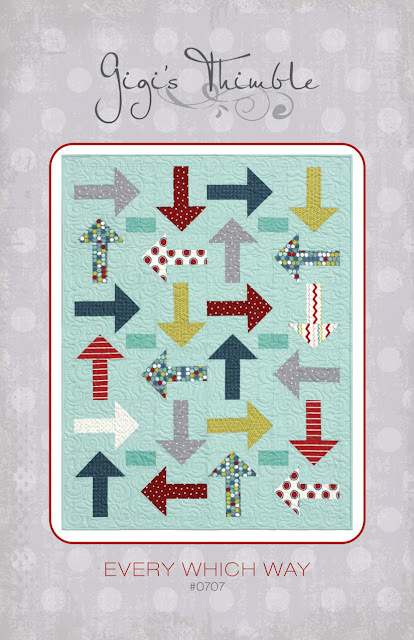 She used an assortment of fabrics for her arrows (incorporating all of the colors from the border fabric) to give it a real scrappy feel and then she backed it with a light green minky to make it extra soft and cuddly. She finished the whole thing off with an all over arrow quiting design. Pretty fun if you ask me! Thanks Aniva for sharing this project with me (and letting me snap some pictures of it too)! You've inspired me to make a big one for my 8-year old whose been crushin' on it ever since Market. You can find the Every Which Way pattern HERE. Also, there is one more day to enter my scrapbag & Gigi's Thimble pattern giveaway. Click HERE to enter. I am in love with that pattern. It's definitely at the top of my wishlist. Cute! I love Every Which Way and the fabric she chose. Awesome "scrap" quilt, too! Love! I love the pattern and just got mine from the Fat Quarter Shop!! I thought this would be a great quilt for boys but from the above comment also for girls it seems. Lovely example of a great pattern! What a great patern, really a boy's thing. Absolutely love these quilts. So cute! !